This chart summarizes Metro’s most recent stop-level Automatic Passenger Count (APC) data from Route 36. The bars show the average daily number of boardings and deboardings by stop, and the origin of the bars is the average daily “load approaching” for each stop; i.e. the number of riders on the bus as it approaches each stop. Thin colored lines show the load approaching by time period. This is the passenger data Metro’s planners refer to when they do their work. There are lots of caveats that accompany this data. A degree of error is intrinsic to APC technology. In the average, these errors are statistically “washed out” to a higher degree as the sample sizes are increased. Thus there is more confidence and less error in the all-day average than in any one time period, and similarly between (say) the mid-day data than the night data. The data do not quite begin at zero probably because of the complicated configuration of the 36 at its northern end: some trips are through-routed as 1s, others terminate at 3rd & Lenora, others (diesel peak trippers) at 6th & Lenora. 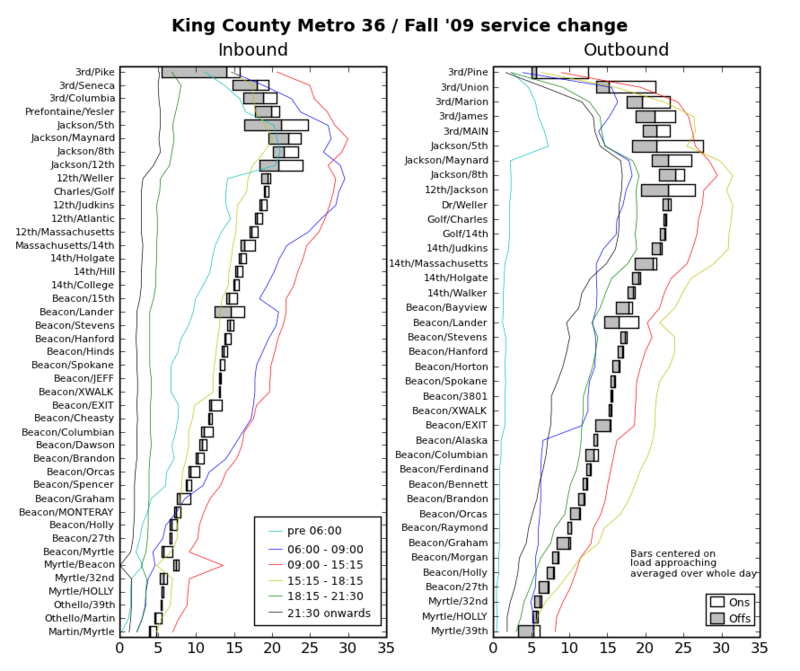 It’s also worth noting that the data begins at the Fall ’09 service change, when the 36 was extended from Beacon & Myrtle to Othello Station, so the data partially reflect the initial bedding-in of Link and the revised 36 alignment, when ridership patterns had not yet adjusted to the new network. * S Jackson St, including the parts outside the RFA, is a blockbuster ridership corridor with a constant on-off churn, comparable to 3rd Ave. This bodes will for the First Hill streetcar’s ridership. * Density and land use drives ridership. Even ten minute headways doesn’t seem to motivate residents in Mid-Beacon to to ride the bus to shop at the commercial area at Othello, whereas the data suggest that happens much more between North Beacon Hill and Little Saigon. Ridership fizzles out, with the bus steadily unloading as it leaves downtown. * I wonder if the early morning ridership spikes that begin and end at 5th & Jackson could be related to Sounder? The VA hospital is evident in the “Beacon/EXIT [VA HOSP]” AM/PM peak data. Those of you who live or work on Beacon Hill, please let us know in the comments what else you see in this data that I’ve missed. Re: 5th and Jackson – I think this is also due to the DSTT; if you’re going to/from the Eastside or other non-local routes this is the best transfer point. Another spike that might have been too obvious to mention is Beacon/Lander where the light rail station is. It’s also the point where the 60 intersects/diverges so there is probably some related transfer traffic. What would be real interesting is to see this dataset pre-Link. And notably the Beacon/Lander station has a reversed on/off flow from the rest of the non-downtown/ID stops – off in the morning and on at night. Good to see the high ridership potential for the FHSC. People keep complaining that it won’t be an efficient way to get from downtown to Capitol Hill, as if that was the purpose of it. In practice it will be a series of corridors–ID to Little Saigon, Little Saigon to First Hill, First Hill to Capitol Hill. It will also be the easiest way for Link riders from Rainier Valley to get to First Hill, rather than taking any of the congested buses from downtown. Isn’t this the design motivation for the streetcar system in general? I mean, once we build out beyond the current SLU streetcar, which is pretty purpose-built as it is. Surely we understand that this is also the way many of our busiest buslines function. Great data, Bruce. I’d love to see some transit-loving graduate student take a stack of data like this and make a map out of it. You could get a sense of the number of people transferring and where from – ooh, you could even use ORCA data and know exactly what routes people transfer to (at least a large representative sample of these people). In a perfect world with tap on / tap off you could know exactly where every trip starts and ends, which could tell us how to modify routes to fit peoples’ needs. Even without tap-on-tap-off, you can infer everything you need from ORCA. The pay-as-far-from-downtown-as-possible fare policies cement this. You see where people enter and exit the system, and what routes they take in between. You can infer the transfer points easily. Even if it’s a a trip that only uses pay as you enter routes, a round trip fills in all the missing data. If you see NB 48 taps at 23rd & Jackson, and SB 48 taps at 85th & Wallingford, you have a pretty good idea what’s going on. I ride the 36 downtown a couple times a week. Many Asian people who live on Beacon Hill, especially the elderly, use the 36 to go shopping in the ID and Little Saigon. They ride the bus down from Beacon Hill and then back. It would be interesting to see data on what the transfer rate is from the 36 from and to other routes in the Jackson St. corridor. The increased boardings and de-boardings at Beacon and Lander are also affected by the proximity of the Red Apple market. Lots of people combine a trip to the market with their trip. I firmly believe demographics are more of an issue than density here. There are at least two generations of people who live on N Beacon Hill who have been taking the #36 for decades to work/shop/socialize in the ID. There just isn’t the same connection with Othello. Great to have route data displayed this way; puts it in a form that non-geeks can grasp easily. But why does it take 20 months to generate? I’d be much more impressed if the data were six months old instead. This is the most recent data I could get from Metro for this route. Some routes have data from Fall ’10, but this isn’t one of them. This was the latest data I got from Metro as of a month ago. What would be interesting to me is seeing how these patterns compare to other routes. I’m guessing it must be similar. 4-5 stops with most of the on/off volume and then lots of other stops with very little (but nevertheless worthwhile to have, so it’s accessible to more people, since it’s going by anyway). Being that this data is from 09 and this is 2011, I’d say a majority of this information is out of date. Since 09 I’m sure ridership has increased significantly due to the economy, parking costs downtown skyrocketing and other factors. As someone posted, I’d be more interested in recent data. All this does is explain what happened 2 years ago. Good for you. I want to know what is happening now and in the future. As I noted above, this is the most recent dataset Metro has available for this route. It covers the period from July ’09 to July ’10. It’s probably true that ridership has increased across the board, although total ridership is not the focus of this post, rather I’m interested in how busy the different stops and areas are. I think this still fairly accurately describes the ridership patterns on the 36, as land-use patterns have not radically changed in that time. It may slightly understate ridership on Myrtle, but that’s about it. Ah, no. The recession has eaten into ridership since unemployed people don’t commute. Amazon has moved jobs to SLU but that’s just left holes in other places. Less people work DT that did a decade ago. Remember Washington Mutual? WaMu went under the year before this data was recorded. Downtown vacancy rates peaked around ’08, and office buildings have been filling back up. If this was data from ’07, your complaint would seem more legitimate. It would be interesting to see ridership of Route 60 in the same corridor. There’s a lot of transfer action at 12th/Jackson from the 60 to downtown buses. Also, there’s been a stop consolidation initiative on the 36 that has eliminated some of the thinner stops. 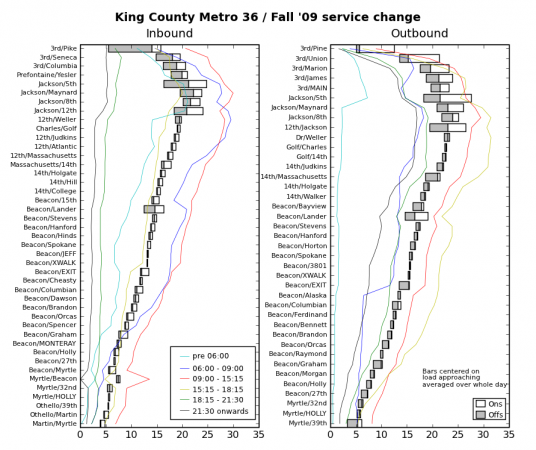 I wouldn’t spend too much time analyzing the ridership to/from Othello Station in Fall 2009. That routing was new and it was soon replaced by a temporary shuttle from the old terminal at Van Asselt, due to construction. The 36 had a history of erratic operation prior to Link’s opening due to the different terminals and a goofy 8/12/8/12 headway pattern for a large part of the midday hours. I would expect that better schedules and a more consistent route map will eventually lead to improved ridership over the whole corridor. There’s a lot of transfer action at 12th & Jackson, period. It’s a huge stop for every bus through that corridor. You don’t need numbers to show that, I think simply riding any Jackson St route will demonstrate the massive demand from 4th to 14th. As a regular 14 rider, the article’s first bullet point was a “well duh” moment for me. September 2010 was when the construction project that forced 36 riders from Othello station onto the shuttle buses wrapped up. Again, I wouldn’t use ride data from Fall 2010 to draw any conclusions about the success/failure of the 36 extension to Othello. It might provide a good baseline number, however. I don’t know how the APC technology works, but on crush-loaded 36s, 12th/Jackson is usually considered to be a “bonus” RFA stop. The drivers will open the back doors and people will load and unload through both doors. I don’t know if those de-boardings get counted as trips or if those riders disappear without getting counted. Right, duh, Jackson Street is a very busy corridor and 12/J is a huge transfer point. That’s why I get so exasperated when I read reorganization plans that don’t connect either of Beacon Hill’s bus routes to Jackson Street and downtown or plans that want to force all Jackson Street bus riders onto the 14! It would be very interesting to see what happened to the ridership & boarding numbers in the south portion of the route over the past year, as Link ridership (and thus transfers at Othello station) has ramped up. The south section of this route, going through a single-family neighborhood, is never going to be as successful as the rest of the route, but I’d be very interested to see the change in Myrtle x MLK boardings graphed against the change in Link ridership. Of course, publishing data for the public seems to have been one of those Wasteful Programs that got the axe in the name of cost savings. So we probably won’t be getting any more useful reports out of Metro any time soon. I suspect I’ll be able to get my hands on ’10 data soon. I hope to compile some useful reports like that. Thanks for the work you put into this Bruce. Thanks for the legwork getting what data is available and presenting it in a format most of us can understand. My complaint is also the timelyness of the data. It begs the question as to what’s more important, Accurate Information or Recent Information. The data is probably as close to right as they can get it, but ancient history as far as making decisions in real time. If I were a policy maker, I’d prefer current data, with some holes in it, rather than what happened 2 years ago. The same for Metro’s budget process and reporting is true. It’s hard to drive a ship up the Thames in a fog bank, when your latest GPS plot was from last year! All this data from Orcas and APC is downloaded daily into a computer. It seems like a little code could spit out some useful info on a monthly basis (unfiltered). It would be nice if the ORCA readers could be updated, stop by stop, for real-stop boarding/alighting data, instead of rough sampling like this. ORCA readers already do that, but there are privacy issues associated with giving out that data, plus you miss the not-inconsiderable number of people paying other ways.